It floods everyone’s instagram feed and the vast majority dreads it—Monday. But why? I know there is the one side where people say “if you are doing what you love you shouldn’t be working for the weekend”. Though there is this mindset and I agree with it, the sad truth is a huge portion of the population don’t feel this way. Living as an expat, a lot of places of business take Monday off. Heck, all of Europe takes all of August off. I have also come to notice that some businesses don’t even open on Monday here. Sunday is still observed as a day of rest and a day with family and some businesses (not all) remain closed on Monday. It made me think that maybe Monday should approached differently—not exactly a complete day of rest because the reality is that Monday is a universal day of business, but maybe it should be approached as a day where we function at a different pace to make the rest of our week more productive. It should be day of transition so we can appreciate and enjoy our whole weekend vs having that anxiety hit us on Sunday afternoon or evening. The weekend is your time to recharge and if you are living in the US (especially NY), you need those 2 FULL DAYS. 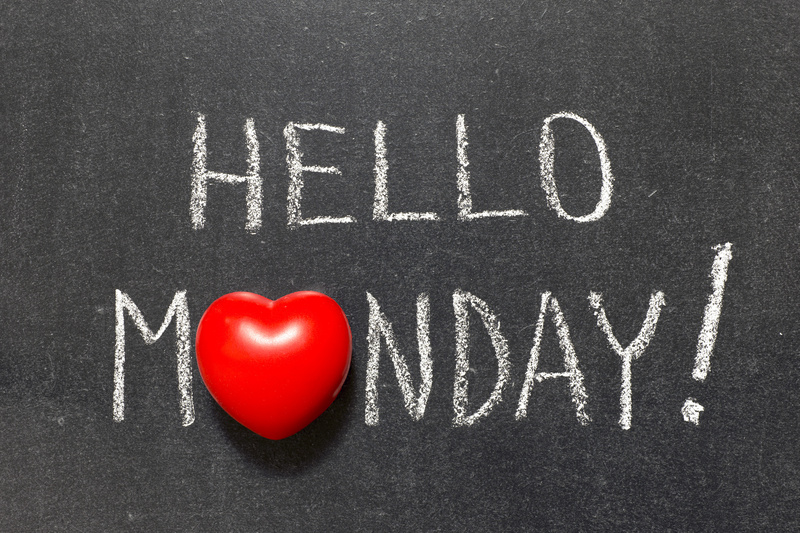 Here are your 5 “M”s for making the most of your Mondays. I have personally found meditation to be a source of tranquility and balance for me. I try to do it a few times a week and mostly in the mornings or when I feel I get stuck during the day. There is a preconception that meditation is having your mind completely blank but that is not the case . It is time for yourself to make sure you are in line with your inner self and path. What I love about starting out your Monday with this short exercise is that it lays down the foundation for the week. It is also a good reset and a continuation of your weekend, where you were hopefully in a more relaxed state. Pro-Tip: If you are new to meditating I highly recommend the Oprah and Deepak 21 day series. This one is as simple as it sounds. Just get up and move. I’m not suggesting full blown exercise, but if you want to—go for it. It is as simple as getting some fresh air, stretching, walking your dog. Honestly moving and meditating are interchangeable in regards to steps. Whatever you do, do not check your smartphone when you get up–that includes checking your instagram feed. Just get up. Do something. Take a walk, grab a coffee, mediate. Whatever you do—do not connect to tech. Pro-Tip: If possible, keep it in airplane mode until normal business hours and after normal business hours. This should be time used for connecting outside of the virtual world. So not all of these actions will be pleasurable, but who said life was ever easy? I recommend scheduling the hardest of your meetings or one involving someone you can’t completely stand on a Monday. Why? It’s twofold-1. You get it over with and won’t have to have anxiety about it for the rest of the week. 2-That will be you at your worst. You will probably learn something about yourself that you need to work on. Example, there is this one person I cannot stand (we all have one). Whether or not this person is part of the meeting, this person’s name usually comes up and I automatically get defensive and my personality shifts. I know it is something I need to work on and this exercise makes me more aware that I need to find a better way of dealing with it, which leads to my next Monday must…. This one is of course my favorite. I mean, I love massages, but having one every Monday evening has been life changing. One because it releases tension from my day and two, because it helps me reground myself, relax and focus. For instance, in the example above I needed to release the tension that was created from my meeting, but it also allowed myself to clear my mind and regain focus, plus it is a great continuation of your mental weekend. And if you aren’t going to do it for those reasons, massage is also a good way to release toxins out of your system, especially if you imbibed during the weekend. Pro-Tip: Get an at home massage so you keep yourself in that post-massage bliss state right before you get into bed. My two favorite ubers for massage are Urban Massage (Paris and London) and Zeel (NYC). We all have “to do” lists that are never ending. Get rid of those and do a “Must List”. What do you really need to do/really accomplish. Why after a massage you wonder? Because you are more focused and clear on what your objectives should be–you can more easily cut through the bullsh*t. We create endless lists for ourselves but at the end of the day, most of them aren’t required, and most can be delegated. Think about what is important to you and what you REALLY need to do in order to achieve your goals. Pro-Tip: Do it in excel with 2 columns—first for the task second for the completion date and then data sort. This will help keep all in check and on track. Another good go to when I’m in a more hands free mode is Google Assistant. Now that you have these 5 easy and quick tips hopefully you will enjoy the full benefits of your entire weekend and kick of your week to a great start!